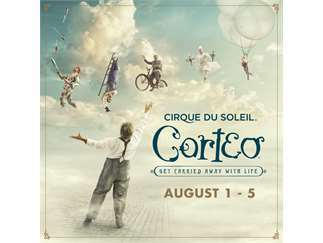 Corteo, the latest Cirque du Soleil’s arena production, embark on a new journey throughout North America. The show will visit Jacksonville at the Jacksonville Veterans Memorial Arena, from August 1 to 5, 2018 for a limited run of seven performances. This unique production, directed by Daniele Finzi Pasca, first premiered in Montreal under the Big Top in April 2005. Since then, the show has been a great success and has amazed 8 million people in 64 cities in 19 countries on four continents. Corteo, which means cortege in Italian, is a joyous procession, a festive parade imagined by a clown. The show brings together the passion of the actor with the grace and power of the acrobat to plunge the audience into a theatrical world of fun, comedy and spontaneity situated in a mysterious space between heaven and earth. The clown pictures his own funeral taking place in a carnival atmosphere, watched over by quietly caring angels. Juxtaposing the large with the small, the ridiculous with the tragic and the magic of perfection with the charm of imperfection, the show highlights the strength and fragility of the clown, as well as his wisdom and kindness, to illustrate the portion of humanity that is within each of us. The music turns lyrical and playful carrying Corteo through a timeless celebration in which illusion teases reality. The concept and disposition of the stage bring the audience in a theatrical atmosphere like never seen before in Cirque du Soleil arena shows. The set curtains, inspired by the Eiffel Tower, and the central curtains, which were hand painted, give a grandiose feel to the stage. This sets the tone for the poetry of Corteo. The cast of Corteo includes 51 acrobats, musicians, singers and actors from all around the world. Cost: Call (904) 630-3900 for more information.